How to add contributors to my Project? 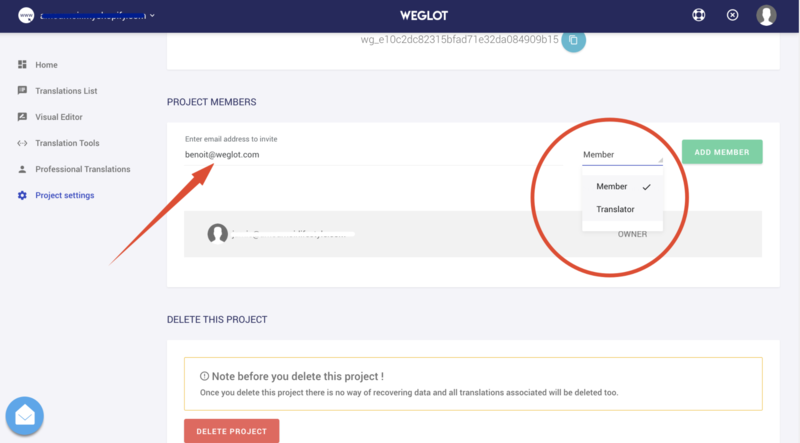 In this article, you will find how to add/delete user(s) in your Weglot Project, to allow people to manage translations of the project. Note that this feature is only available subscribing to the Pro Plan. There are 3 different kinds of Weglot User: Translator, Manager and Owner. The project creator is directly defined as project owner. NB: Managers and Translators can order Professional Translations, but only using their own credit cart. That's it! The new Member will receive an email to log in to Weglot (if he doesn't have a Weglot account yet, he will have to create one). To delete a member, simply click on the trash at his right. How to edit my translations? How to change a Media (Image, PDF ...) in my translated version? Translation Tools - How to use the Translation Exceptions edition tools? Translation Tools - How to use the Search and Replace edition tool?